It is astounding how much emotion and beauty can be found in such a simple instrument, which imitates the human voice. The Music of the Golden Age sounded in the Museum of Huesca. Nadine Balbeisi (soprano) and Fernando Marín (vihuela de arco) presented a concert titled “Cantar alla viola” in the museum’s Doña Petronila Hall , which was an activity included as part of the program of the 38th edition of the Film Festival in Huesca. The American soprano of Jordanian origin is an artist in residence in our city, researching and studying music in the Cathedral’s archives. This music is closely related to the repertoire they performed in the Museum, which consisted of works from the Spanish Golden Age. Cantar alla Viola is the Renaissance method of accompanying the voice with a viola da gamba, in this case with the vihuela de arco (an instrument of Aragonese origin and ancestor of viols), whose sound adapts perfectly with the sweet voice of the soprano, achieving a warm and adequate mixture for this kind of music. 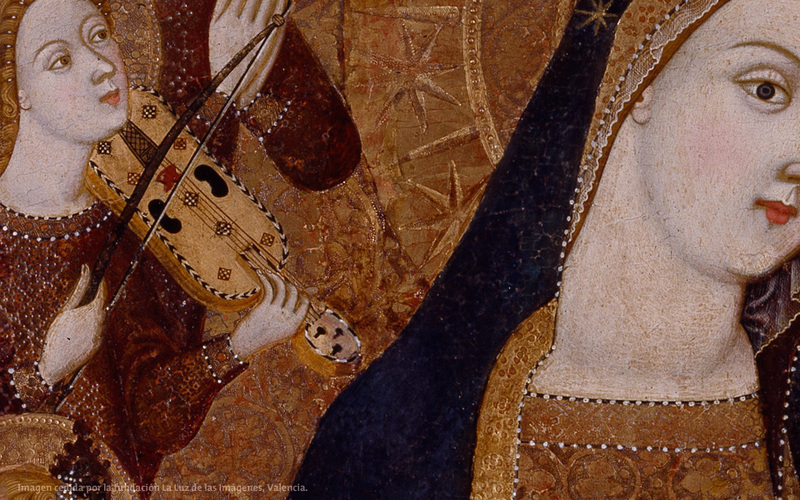 They interpreted religious and secular works of a wide period reaching from the Medieval to the Renaissance. The oldest works, Benedicamus IX and XIV, from the Huelgas Codex (XIV Century), were especially appealing because of the beauty of their ancient traits the ornaments and trills in the voice and the security of execution. They performed two very beautiful and complicated works, Ave maris stella and Pange lingua by Henestrosa-Cabezon, in which the vihuela moves more while the voice maintains a calm and gentle mood, which predominated the concert. There were various secular songs from the Cancionero de Upsala: Para verme con ventura, Un dolor tengo en el alma, Como puedo yo bivir and Que todos se pasan en flores, which were all interpreted very expressively by Balbeisi. The Soprano gave the same feeling and quality to No se puede llamar fe, Es la causa, Mas vale trocar o el romance Que es de ti desconsolado, all songs by Juan del Encina. The Vihuela de arco displayed its brilliance in Luis de Milan’s Romance de Moriana, which had the most elaborate melody for the vihuela. Coming from the Chambre separée. Robert Jones: The Second Booke of Songs and Ayres. 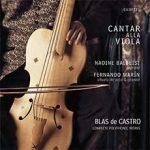 Cantar alla Viola: Nadine Balbeisi (Sopr.). Lyra-viol: This instrument is not one that you run into everyday. It is a particular English form of the Viola Da Gamba, set up mainly for the possibility of playing chords. The set of metal resonance strings give this alto version of the (young) Barytons its special sound. What did one do with the Lyra-viol? One could wondrously and smoothly accompany a voice on this instrument, with a range of over three Octaves, without necessarily needing a chordal instrument to fill in the harmonies. Therefore predestined for >Chamber Music< in trusted intimacy – and exactly this is what the soprano Nadine Balbeisi and they Lyra-viol specialist Fernando Marin cultivate. As a Duo, Cantar alla Viola holds a rather singular position. Incidentally, one does not necessarily have to hold this instrument between the legs and use a bow; one also has the option of placing it on the legs and plucking it like a lute. Even small imitations-playful ones, sometimes plucked and then sometimes bowed are all there, without further ado. More flexibility is hardly thinkable in the chambre separée for musically inclined people. The Second Booke of Songs and Ayres by Robert Jones, contemporary of Dowland, has the appropriate delicate and subtle “intricate Song” for the performers. The singing is entirely in the prevailing taste of the period, for which the singer has the right feel. It requires affect, but in this particular combination only in small doses. Fernando Marin used performance technique advice from writings by Gannasi and Castiglione. He leads the bass line smoothly, like a second singer, and with as equally clean gestures, effortlessly creates the supportive harmonies. It is something for fine ears in romantic hours of early baroque.